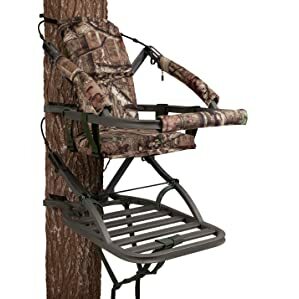 6 Best Climbing Tree Stand Reviews 2019 - Which is for Bowhunting? Even though hunting requires precision, accuracy, and strength in the moment of truth, the most experienced hunters know that it also takes patience, calm nerves, and longevity to be great. Hunting requires long periods of waiting, which can leave hunters ill-prepared for when the game does come. Luckily, tree stands are a great solution for the moments in hunting that aren’t action packed. Climbing tree stands elevate the hunter, giving him or her a great vantage point over deer or other large game. They also help the hunter stay in an active position during restful times, helping him or her concentrate fully for when their game decides to come near. 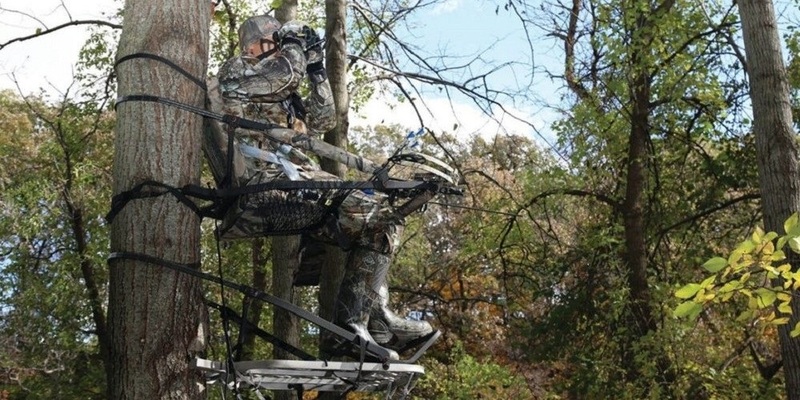 Relying on the best climbing tree stand of 2019 can make the difference between hitting a clean shot and letting your target get away. Tree stands are one of the choice methods of hunting big game for experienced hunters for a number of reasons. The main advantage of using a tree stand is their ability to give the hunter a view over small brush that may interfere with the hunter’s line of sight. For this reason, it is important to set up a tree stand above the line of small brush, but below the line of larger tree branches that may interfere in the same way smaller brush would. Climbing tree stands give another advantage in their portability – it is usually extremely easy to move from tree to tree quietly and quickly, in order to secure the best vantage point available. This is why climbing tree stands are more popular than ladder stands and hanging stands, which are usually permanent and fixated to a single tree. Tree stands also offer comfortability for the hunter during waiting periods. They allow a hunter to remain focused, yet comfortable, keeping their nerves calm for a steady shot when the time comes. Lastly, there are a few accessories that are available for climbing tree stands. 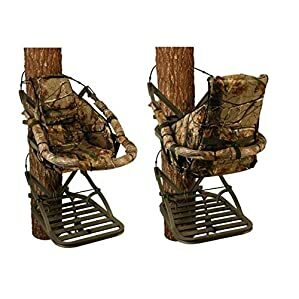 Most stands come in camouflage to conceal the hunter, and many have add-ons like seat pads, bow holders, hunting blinds, and shooting rests. Tree stands come with a rope pulley system to pull gear and weapons to the hunter once in the stand. It is important not to climb the tree stand with weapons in hand, and to instead use the pulley that is given to you. When choosing the climbing tree stand that is right for you, there are three main factors you want to inspect: additional features, comfortability, and safety. 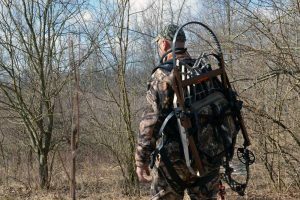 Safety being the most important factor, we recommend going with a company like Summit Treestands or Lone Wolf Treestands, which have both been perfecting their quality of tree stand for years. Additional features, like the ones we mentioned earlier, will improve your hunting prowess and make it easier for you to maneuver with your weapons and gear in the tree. Lastly, a comfortable climbing tree stand is not necessary, but is extremely convenient, and for the low added cost, we definitely recommend purchasing a comfortable tree stand. The most comfortable stands we tried had a nice back. Climbing tree stands can improve your hunting quite a bit, or just give you an overall different hunting experience. Whatever your reason for looking into buying a climbing tree stand, we’ve nailed down the best ones for you. The Summit Viper SD Climbing Tree Stand has been Summit’s most popular model over the last 17 years, and a staple for the worldwide hunting community. We loved its portability (it weighs in at only 20 pounds), as well as its additional features and relatively inexpensive price. The Viper SD features Summit’s DeadMetal sound-deadening technology, which means setup and tear-down will be quiet. This minimizes your presence in the field, and could allow you to hunt game quicker than other models. This model was very easy to use as well. It features a comfortable back rest and a padded seat that could be raised or lowered, depending on if you use it for bow or gun hunting. The front bar doubles as an easy way to climb to the seat, as well as a gun rest. This model also comes with a 4-point FAS harness, which assures that you will be safe and secure in the tree for long periods of time. 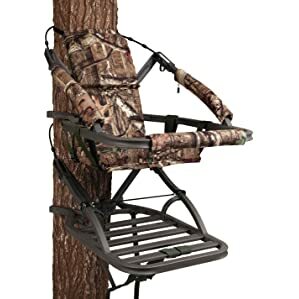 This stand can hold up to 300 pounds, which is more than enough for the average hunter, and comes with a convenient camouflage back strap for carrying. Overall, this model easily passed our three checkpoints, and came at a great price too. It was no wonder to see why this was the most popular model on the market. The 180 Max SD climbing tree stand by Summit is aptly named – it is absolutely the maximum value tree stand on the market today. Loaded with all kinds of features, this model comes at a high sticker price; however, we think for the professional hunter, this model is absolutely worth it. The second half of this model’s name is the 180 portion. This name is given from the fact that you can actually pivot a full 180 degrees in your seat – enough to hunt facing the tree. While this may seem like a silly idea at first, hiding and hunting from behind a tree could provide you with the extra dense coverage you need for a skittish buck. We realize not everyone needs this feature, but we found it to be very helpful in certain situations. The 180 Max features Summit’s largest platform, which gives more legroom and added comfort for longer hunts. Like the Viper model, the 180 Max comes with a padded adjustable seat and backrest, steel climbing cables and a 4 point harness. Yet, for all the added features and stability, this model still only weighs 26 pounds. For those looking for the best model money can buy, Summit’s 180 Max SD is the one for you. The Summit Cobra SD is the best model for bow hunters on our list. Compared to the Viper and 180 Max models, it is an open-front climber. This means it does not have a front bar or gun rest that would impede movement for a bow hunter. It is ultra portable at 18 pounds, yet does not compromise on weight, stability, or comfort. The Cobra SD comes with a padded seat, backrest, and an aluminum frame with Summit’s DeadMetal sound-deadening technology. It also comes with a harness and climbing cables for extra security while in the tree. The main draw of this model is in the value it gives for the price. Bow hunters will love it for the open-front nature of it, while it still maintains a functional frame and comfortable back. Summit’s Goliath SD climbing tree stand is best for larger hunters, those who carry lots of gear, and those who are looking for the sturdiest and largest model on the market. Like the Viper SD, it is closed-front and locked in place, so it can’t pivot like the 180 Max SD. It also has all features that the Viper SD boasts, such as a padded back rest, climbing cables, etc. The main difference lies in its wider top, while still only adding a pound over the Viper, thus still keeping it ultra portable. The Goliath can also hold up to 350 pounds of person and gear, while the Viper can only hold 300. For all intents and purposes, this model functions very similarly to the Viper SD, but offers more room and stability for larger hunters and those looking for more room to maneuver once in the tree. The Lone Wolf brand has been crafting tree stands for years, each model being more lightweight and yet more sturdy than the last. One of their newer models, the Hand Climber Combo II, is our favorite for those who need a super lightweight yet sturdy tree stand. While it weighs in at 17.5 pounds – the lightest model on this list – it also supports up to 350 pounds, something only Summit’s larger and heavier models could boast. While the Summit models all had 4 points of fall arrest, the Lone Wolf models boast 6 points, giving you extra security and peace of mind. This model in particular is great for bow hunters, as it is open-front, does not have a backrest, and features an in-cast bow holder. The main benefit of this model over others is its lightweight profile and ultra portability – it folds down into a 5 inch packed profile! Lightweight bow hunters should love this model. Our last selection for one of the best climbing tree stands is Lone Wolf’s Sit & Climb Wide Combo II. For good reason. We feel that even with the high price, any professional hunter should have this tree stand in their arsenal. 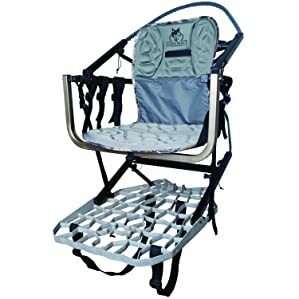 Weighing in at 21 pounds and supporting up to 350 pounds, the Sit and Climb Wide features a super comfortable seating pad and back rest, and packs down to only a 4 inch profile. The sit & climb bar unique to this model provides easy climbing to the seat by pivoting. 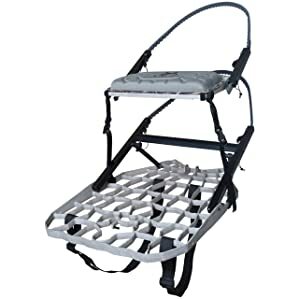 It comes with cinching straps to tighten the seat to the platform, making it extremely sturdy. This model features an in cast bow holder, but is also great for gun hunters as well. It is extremely comfortable, extremely sturdy, and for the small weight, gives a lot of room that most other models do not have. This model is ultimately for those looking for lots of room, but still want a lightweight portable package. Lone Wolf adds to this model’s portability and comfortability by offering accessories like padded backpack straps, a sit bar pad, and a foot rest. We feel like this is one of the best models of 2017, depending on what features you are looking for in a tree stand. In order to get the most out of your climbing tree stands, it is important to know how to use them. You start by securing both platforms at the ground level, and then inching your way to the top while secured by a harness. While it is dangerous, if you take the correct precautions, setup and tear-down can be a breeze. Install climbing base by pulling the belt from its tube and securing around a tree. Do the same thing with the seat frame, securing it around the tree. It is important to secure both the top and bottom climbing supports to each other via a cinch or fastener. You can now stand on top of the base, and secure yourself to the tree via a harness. Raise the climbing base with your feet by placing your feet below the hinges and bar. This will allow you to climb the tree, while still securing yourself to the tree via the harness and top stand. You can move the top stand up, and repeat the process until you reach your desired height. Once you have reached your desired height, fasten your harness and all the straps to each other, securing yourself in the tree. Once you’re in the tree, it is important to know how to retrieve your gear. Summit’s models all come with climbing cables to pulley your gear up. This way, you do not have to repeat the above steps with loaded gear in hand, for extra precaution. Once in the tree stand, you have a great vantage point, and can hunt at your leisure. If for any reason you do not like the vantage you have over your field, you can raise or lower the stand, or find another tree altogether to set up. That is the beauty in the portability of climbing tree stands, and one of the main reasons hunters use these models. In order for you to remain safe during use (who said carrying a loaded weapon while climbing a tree sounded like a bad idea? ), we’ve compiled a short list of safety tips for you to keep in the back of your head. Before you set up your climbing tree stand, make sure that the weak points on the harness and platforms are checked, especially after years of use. While setting up the platforms, make sure everything is secure and locked in place. Make sure the tree stand belts are wrapped tight along the tree before putting your full weight on them. While raising the tree stand platforms, make sure your harness is secure and attached to the tree. Never climb the tree with your weapons or gear. Instead use climbing pulleys to pull your gear up after you are at a secure spot. Always wear your harness while hunting on the climbing tree stand. While descending the tree, make sure that you are again locked into your harness, so if the platform falls, you will be secure. So there you have it. 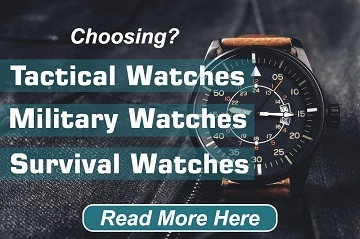 We think that any of these models will provide you with a great hunting experience by giving you great security, a great advantage in your line of vision, and superb comfort. If you’ve bagged anything while using these stands, we’d love to hear about it! Tell us your story in the comments below!